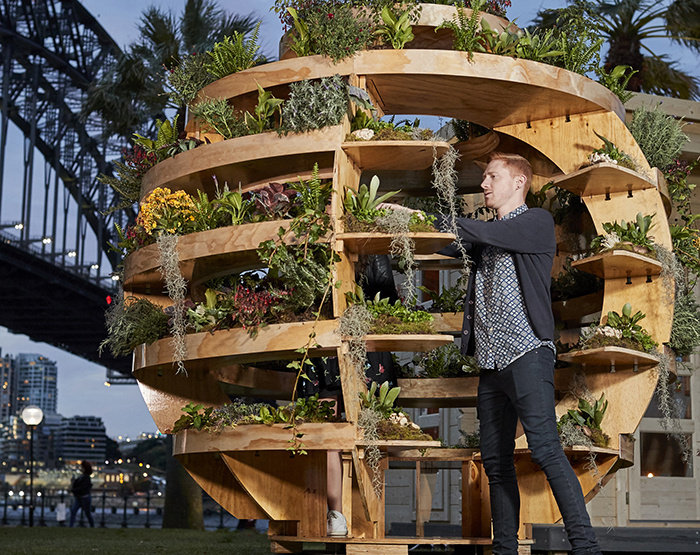 Last week IKEA’s critically-acclaimed Growroom was showcased here in Sydney. Growroom is essentially a DIY vertical garden, but more than that it’s an amazing urban farm pavilion that explores how cities can feed themselves through shared food-producing architecture. The Growroom, designed by architects of the CHART ARCHITECTURE competition, which was supported by SPACE10 – IKEA’s future-living lab in Copenhagen – is an ingenious spherical garden designed to optimise space and light for growing herbs and vegetables. The small footprint makes it ideal for urban environments, empowering people move from being passive consumers to growing food locally and in a sustainable way. It’s also an urban sanctuary, with the design allowing you to sit inside the spherical oasis surrounded by the plants. Giving Sydney a taste of the shared community and ‘co-living’ environment we might experience in the sustainable community of the future. The IKEA Shared Dining Experience under the iconic Harbour Bridge. To make the this DIY vertical garden accessible to everyone it’s an open source design. The Growroom’s Creative Commons Attribution 4.0 International Public License means that the design can be shared, copied and built upon by anyone. Tapping into the emerging potential of new generation technologies available to the public in any major city, the cutting files for the Growroom are available to download for free. All you need to build it is a hammer, screws and ply wood and a visit your centre with a CNC milling machine. The design focuses on making the assembly easy and intuitive. Being produced from a single raw material, the Growroom is accessible and affordable for most communities. Taking flat pack to another level! These images via SPACE10. A larger version of the Growlab was exhibited at CHART ART FAIR and later on Vice’s Munchies Festival in Copenhagen’s meatpacking district. Visitors were invited to step into the farm, smell the abundance of herbs and plants, and taste a future where food is produced in a sustainable manner—much closer to consumption—inside our cities and as a natural part of people’s lives. Unless otherwise noted, all photos supplied courtesy of IKEA. The Growroom is an amazing example of innovative thinking towards a sustainable future. If only I didn’t live in an apartment I’d be getting right onto it! IKEA’s ongoing focus on sustainability and Democratic Design is all about making the right combination of form, function, quality and sustainability available to the masses and growroom ticks all those boxes and then some. You can find more information about the Growroom DIY vertical garden pavilion, together with the link to download the file and assembly instructions on the SPACE10 website here.